The number of electronic devices that have their own IP addresses and connect to the internet, in what is commonly referred to as the Internet of Things (IoT), is forecasted to reach 80 billion by 2020. But there are other items connecting to the IoT, too, not just electronic devices. That’s because everyday objects can now use embedded NFC tags for connectivity. A growing array of familiar consumer goods, including apparel, footwear, foods and beverages, cosmetics, and pharmaceuticals are now becoming smart and cloud-connected. They use a unique electronic ID, in the form of an NFC tag, to interact with tag readers and go online. As more products in the consumer packaged goods (CPG) sector connect to the internet, the lines between the digital and physical world continue to blur. The Internet of Things is becoming the Internet of Everyday Things. A recent study by Vandagraf International, a leading market-research institute, forecasts the total market potential of connected packaging and labels will jump to 1.2 trillion units in 2021 and 1.5 trillion units in 2026. What’s behind this rapidly growing trend of adding connectivity to consumer products? For many brand owners, it’s versatility, made possible by dynamic year-on-year growth of NFC devices. The NFC technology used to power smart, connected products and packages is remarkably flexible, and enables a wide variety of applications, including new levels of pre- and post-sale consumer engagement, location awareness, robust brand protection, tamper proofing, and parts configuration. NFC is a seamless, intuitive IoT connectivity technology. On-item electronics connect products to the web, by simply tapping products (or packages) with a smartphone, or by placing them on or near smart reader devices. The IoT is based on securely collecting IDs and data from such devices and communicating that information to the cloud, where products have their own addressable digital profiles and can exchange data in real time. NFC works with proximity reading capabilities (up to 10 cm), and is also compatible with vicinity RFID reading capabilities (RFID up to 1.2 meters). NFC technology uses three application layers to manage the data associated with a product. These layers make it possible to capture, store, present, and analyze many different categories of information, for multiple benefits. 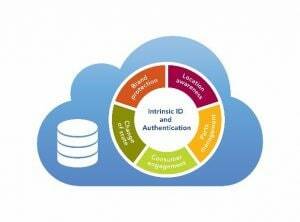 Intrinsic ID Layer: Stores a secure ID on the electronic device to provide an assurance of authenticity and provenance. Products must be authenticated before any interactions take place, thereby providing an extra level of defense against counterfeiting and market diversions. On-Product Electronic Device Layer: Stores smaller amounts of data on the product or package’s electronic device. The on-pack data can, for example, confirm that the tamper loop is intact and the package hasn’t been opened, or that the package has been stored correctly within its specified temperature range. On-pack data can also link to a specific web address in the cloud to extend further actions. Off-Product Cloud Layer: Stores relatively large amounts of data away from the product or package, in the cloud. This is where brand owners can put helpful product information, such as on-line instructions or product ingredients, for consumers to access. It’s also where data on product location can be stored, so it’s easy to check traceability along the distribution chain (including transfer of ownership), or contextualize consumer messages based on where the product is sold or used. The cloud layer can also be used to store rich marketing data, for use with real-time customer interactions such as promotions, online communities, and brand experiences based on the product at hand. NFC’s three-layered application structure means brand owners can select from a wide variety of functions to create a unique offering that meets their specific requirements. The end result is significantly more robust and compelling applications and solutions, and a measurable return on investment. The table describes just some of the business cases enabled by NFC. Here’s a look at just a few of the clever ways brand owners are using NFC technology to enhance their offerings and create deeper customer relationships. Easier customization – Vitamix blenders When consumers place an NFC-enabled container or cup onto the base of Vitamix’s new Ascent or Venturist blenders, the appliance’s NFC reader automatically changes up to 140 parameters, making it easier to modify settings and safely prepare foods. Real-time social media access – Spyder skiwear As part of their support for the U.S. Ski Team, Spyder embeds an NFC touchpoint in the logo on their ski jackets. Tapping a smartphone to the logo lets skiers instantly engage in real-time social media with USST members and share location-based information (e.g. snow conditions, trail maps, local point of interest). Consumer engagement and trends – Malibu rum Pernod Ricard UK, the maker of coconut-flavored Malibu rum, outfits their bottles with a tag that lets consumers access product-related content as well as instant prize wins and competitions with the tap of an NFC-enabled phone. The technology also captures information regarding what content is accessed, and from where. Medication safety – SHL Medical auto-injectors Users of SHL Medical’s auto-injector can interactively access important information and services from the NFC label with a smartphone, and can see a color change on the label when a defined ambient temperature has been reached. Self-medication becomes safer and more intuitive. Product authentication and enjoyment – Geantet-Pansiot vineyard estate Every wine bottle from Geantet-Pansiot vineyard estate, in Burgundy, France, is equipped with an NFC tag that lets customers authenticate the beverage and receive information about the wine (vintage, production, serving temperature, storage, etc.) directly on their smartphone. The wine maker also engages its distribution network with the same technology, to combat counterfeiting and gray markets. Just the beginning The aggressive growth predictions for connected consumer goods, stated above, are a strong indicator that NFC is a compelling technology for brand owners. NXP is helping brand owners take advantage of NFC, by building on our position as a leader in the technology. We offer a full suite of fully-passive tags (which derive power from the field generated by the reader), and a range of battery-assisted sensory tags that can perform precise time and data logging while monitoring and recording the ambient conditions of goods as they’re transported or stored. As demand increases for smart, connected consumer products and packages, we’ll remain at the forefront. We’re focusing on the next steps, by adding innovative security features and making tags even more suitable for in-demand use cases, such as proximity-based authentication and proof of tag presence, and by expanding support for every relevant operating environment, whether it’s online, offline, with apps, or without.